Overall: The Amana ABL2522FES Bottom Freezer Refrigerator is like most Top Rated Amana Refrigerators, you just expect more out of them. This Amana Bottom Freezer Refrigerator is well priced and has more than ample capacity, styling and features that enable it to compete with refrigerators that are twice the price. Capacity: At 25.1 cu. ft., you'll find that this refrigerator has more than enough capacity to handle even your largest grocery trips. Convenient space savers like the Slide-out upper freezer basket makes accessing smaller frozen foods much easier. The Glide-out lower freezer basket with QuickSplit™ organizer offers easier access to larger frozen foods. We loved the touch controls to provide the fridge with more accurate temperature reliability. Thank all things good that numbered refrigerator dials are quickly becoming a thing of the past. Meats and cheeses are simple to keep for longer in their Temperature-controlled Chef’s Pantry™ drawer with divider. If you love fruits and veggies the 2 humidity-controlled Garden Fresh™ framed crisper drawers actually kept our test fruits and veggies fresh well beyond the expected "wither" date. The only thing to be aware of is that there is no ice maker available on this unit which we felt it needed. Colors: We tested a unit with a Stainless Steel finish. It did quite will with our fingerprints test as well as scratches. We really loved how easy it was to clean. MSRP: $1,539.00 was what it should have retailed for but the Amana ABL2522FES is no longer being made and has been discontinued.) 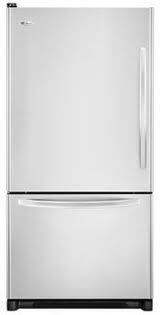 Take a look below for some current model refrigerator reviews. If you do not feel comfortable purchasing a discontinued model there's no need to worry because there are other Amana refrigerators that are worth taking a look at. Don't worry as every year Amana comes out with new models, just click on the blue box below to see our favorite Amana bottom freezer refrigerator reviews.